Our product range includes a wide range of Datsun GO Plus Remix Edition Car, Datsun Redi-GO Smart Drive Auto Car, Datsun Redi-GO 1 Point 0L Car, Datsun Redi-GO 0 Point 8L Car, Datsun Redi-GO Car and Datsun GO Plus Car. The style statement of segment, Datsun GO Remix Limited Edition stays true to its name and offers you the opportunity to lead the way. 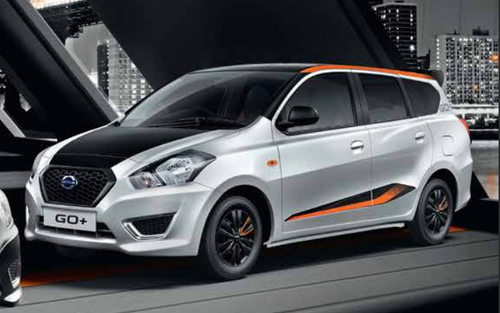 The exclusive Onyx black limited edition with trendy body graphics on the Datsun GO Remix gives it a unique and mystique appeal. ALL-BLACK FRONT GRILLE The hexagonal design of the grille provides the touch of style that the hatchback needs to be called #ThePerfectRemix. STYLISH BLACK WHEEL COVERS The Datsun GO Remix Limited Edition boasts of trendy black wheel covers with orange accents adding to the stylish look and uniqueness of the car. CHROME BUMPER BEZEL The Chrome Bumper Bezel on the front completes the stylish look of the Datsun GO Remix Limited Edition. REMOTE KEYLESS ENTRY Remix the way you lock-unlock your car. With the Smart Remote Key, enjoy the convenience of unlocking your car remotely with press of a button. Step inside the Datsun GO Remix and experience the perfect remix of luxury and sportiness. Make a style statement with the new-look interiors of the Datsun GO Remix Limited Edition and remix your car experience forever. All-new Black Interiors Studded with all-new premium black interiors, the Datsun GO Remix Limited Edition makes a bold style statement. Enriching the classy look, complimenting touches of orange add a dash of fun and sportiness. Handsfree Bluetooth Audio Groove to the perfect remixes everytime you drive. Feel every beat while you feel powerful behind the steering wheel. So jazz up your playlist and listen to it all with its Hands-free Bluetooth Audio System. The revolutionary Datsun redi-GO 1.0L comes with power-packed features & excellent performance. Are you ready to #VoteForMorePower? Vote for more colors in your life. Vote for more power-packed features to enhance your driving experience, while maintaining the ease of your commute. Vote for convenience with the new central locking system and remote key. People voted for comfort and Datsun redi-GO gave them Best-in-Class Ground Clearance to ensure a smooth drive. Bold, brave and sleek, the Datsun redi-GO embodies YUKAN design philosophy. Inspired by the modern trends, the YUKAN design of Datsun redi-GO is a combination of curves, sharp character lines and an ultra-modern look. It promises to floor in the first look and commands a second, third, fourth and many more. Head lamps can say so much. These 3-D shaped head lamps add just the right amount of drama to the car’s surface. The stylish rear design of the Datsun redi-GO adds to its dynamic design and class. The interiors of the Datsun redi-GO are inspired by you. You’ll find ample roominess and cutting edge style, accentuated by classy black interiors. The best-in-class cabin space allows you to drive comfortably and the ample boot space lets you take along all that you need without compromising. Now make your drives more enjoyable in the stylish redi-GO equipped with the new bluetooth audio system. Now you can stretch to your heart’s content. The commanding seating position and the unending long drives, all come together to give you a commute experience like never before! Introducing the Datsun Party candidate, Datsun redi GO – a car that strengthens a sense of freedom, redefines confidence to go further. One that is full of fun and life, just like you. Datsun redi-GO Smart Drive Auto, #TheBetterAMT with dual driving mode for an easy drive. Leader In style Bold, brave and sleek, the Datsun redi-GO embodies YUKAN design philosophy. Leader In Power Datsun redi-GO comes with a high torque, high performance engine with impressive fuel efficiency. leader In comfort & SPACE Datsun redi-GO is in a league of its own when it comes to comfort & space. We promised you and your loved ones more space and to deliver that, Datsun GO+ brings you the comfort of 5+2 seating. VOTE FOR Modern DESIGN It’s stretched body design gives you the freedom to choose between comfortable seating and a large boot space. VOTE FOR BETTER TECHNOLOGY Datsun GO+ doesn’t just look contemporary, it’s contemporary to the core – with an emphasis on thoughtful details that reflects quality. Leader in Driving Pleasure Experience the pure pleasure of listening to your favourite music with the Bluetooth Audio System, and the sheer convenience of Bluetooth Hands-free calling and Digital Clock. VOTE FOR COLORS IN YOUR LIFE. GOLD INSPIRED EXTERIORS The stylish design pattern on the exterior of Datsun redi-GO Gold 1.0L takes style notch higher. REMOTE KEY-LESS ENTRY Live the gold standard life by voting for convenience with the new central locking system and remote key. BEST-IN-CLASS GROUND CLEARANCE The Gold standard 185mm Ground Clearance of redi-GO Gold 1.0L ensures a smooth drive. WHEEL COVER WITH GOLDEN ACCENT Golden Accent of Datsun redi-GO Gold 1.0L takes the style statement to another level. Reverse Parking Sensor Parking made easier and fearless with the Datsun redi-GO Gold 1.0L intelligent reverse parking feature that alerts you of all the obstacles while parking. Truly Gold Standard for a car! The Datsun redi-GO Gold 1.0L comes with an Intelligent Spark Automated Technology engine, which automatically adjusts spark timing in response to fuel quality and power requirement. Vote for a stylish drive with the all new golden black interiors. GOLD THEMED INTERIORS The impressive gold themed interiors of the Datsun redi GO Gold 1.0L are stylish as well as sophisticated. It just blows your mind the moment you get inside the car. Everyone needs Power. But only Datsun GO can give you more of it. Setting a new benchmark in acceleration and control with its powerful 1200 cc engine and a premium design, Datsun GO stands a class apart. While it’s high-end features can give you an entry into the big league. VOTE FOR STYLE From its distinctive front grille to its athletic rear shoulders, the Datsun GO looks modern and robust at the same time. Get ready to shine, for all the right reasons. VOTE FOR Comfort Datsun GO makes the car of your dreams a reality. With impressive acceleration and fuel efficiency, a spacious interior for family and friends, and plenty of room in the boot too, it’s tailor made to your needs. So stop wishing and start driving – today. VOTE FOR TECHNOLOGY Datsun GO is packed with advanced technological features with a keen focus on safety and comfort like the follow me home headlamps, the airbags and much more. Designed For You Datsun GO is truly a home away from home. The car has been thoughtfully designed to suit your needs every time.